"ochi" redirects here. For other uses, see ochi (disambiguation). 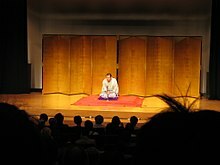 Rakugo (落語, literally "fallen words") is a form of Japanese verbal entertainment. The lone storyteller (落語家, rakugoka) sits on stage, called kōza (高座). Using only a paper fan (扇子, sensu) and a small cloth (手拭, tenugui) as props, and without standing up from the seiza sitting position, the rakugo artist depicts a long and complicated comical (or sometimes sentimental) story. The story always involves the dialogue of two or more characters. The difference between the characters is depicted only through change in pitch, tone, and a slight turn of the head. Rakugo was originally known as karukuchi (軽口). The oldest appearance of the kanji which refers specifically to this type of performance dates back to 1787, but at the time the characters themselves (落とし噺) were normally read as otoshibanashi (falling discourse). In the middle of the Meiji period (1868–1912) the expression rakugo first started being used, and it came into common usage only in the Shōwa period (1926–1989). The speaker is in the middle of the audience, and his purpose is to stimulate the general hilarity with tone and limited, yet specific body gestures. The monologue always ends with a narrative stunt known as ochi (落ち, lit. "fall") or sage (下げ, lit. "lowering"), consisting of a sudden interruption of the wordplay flow. Twelve kinds of ochi are codified and recognized, with more complex variations having evolved through time from the more basic forms. Early rakugo has developed into various styles, including the shibaibanashi (芝居噺, theatre discourses), the ongyokubanashi (音曲噺, musical discourses), the kaidanbanashi (see kaidan (怪談噺, ghost discourses)), and ninjōbanashi (人情噺, sentimental discourses). In many of these forms the ochi, which is essential to the original rakugo, is absent. Rakugo has been described as "a sitcom with one person playing all the parts" by Noriko Watanabe, assistant professor in the Department of Modern Languages and Comparative Literature at Baruch College. 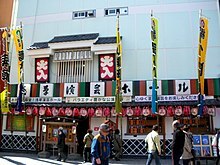 Shinjuku suehirotei is a famous vaudeville theater in Tokyo which hosts rakugo events. Rakugo was invented by Buddhist monks in the 9th and 10th century to make their sermons more interesting and its written tradition can be traced back to the story collection Uji Shūi Monogatari (1213–18). Gradually the form turned from humorous narrative into monologue, probably upon the request of the daimyōs (feudal lords), seeking people skilled enough to entertain them with various kinds of storytelling. During the Edo period (1603–1867), thanks to the emergence of the merchant class of the chōnin, the rakugo spread to the lower classes. Many groups of performers were formed, and collections of texts were finally printed. During the 17th century the actors were known as hanashika (found written as 噺家, 咄家, or 話家; "storyteller"), corresponding to the modern term, rakugoka (落語家, "person of the falling word"). Before the advent of modern rakugo there were the kobanashi (小噺): short comical vignettes ending with an ochi, popular between the 17th and the 19th century. These were enacted in small public venues, or in the streets, and printed and sold as pamphlets. The origin of kobanashi is to be found in the Kinō wa kyō no monogatari (Yesterday Stories Told Today, c. 1620), the work of an unknown author collecting approximately 230 stories describing the common class. 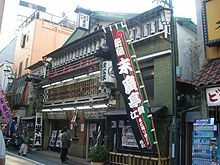 Asakusa Engei Hall is another famous vaudeville theater in Tokyo which hosts rakugo events. Many artists contributed to the development of rakugo. Some were simply performers, but many also composed original works. Among the more famous rakugoka of the Tokugawa period were performers like Anrakuan Sakuden (1554–1642), the author of the Seisuishō (Laughter to Chase Away Sleep, 1628), a collection of more than 1,000 stories. In Edo (today's Tokyo) there also lived Shikano Buzaemon [de] (1649–99) who wrote the Shikano Buzaemon kudenbanashi (Oral Instruction Discourses of Shikano Buzaemon) and the Shika no makifude (The Deer's Brush, 1686), a work containing 39 stories, eleven of which are about the kabuki milieu. Tatekawa Enba (1743–1822) was author of the Rakugo rokugi (The Six Meanings of Rakugo). Kyoto was the home of Tsuyu no Gorobei (1643–1703), whose works are included in the Karakuchi tsuyu ga hanashi (One-liners: Morning Dew Stories, date of composition unknown), containing many word games, episodes from the lives of famous literary authors, and plays on the different dialects from the Tokyo, Osaka, and Kyoto areas. A man faints in a bathing tub. In the great confusion following, a doctor arrives who takes his pulse and calmly gives the instructions: "Pull the plug and let the water out." Once the water has flowed completely out of the tub he says: "Fine. Now put a lid on it and carry the guy to the cemetery." For the poor man is already dead. The joke becomes clearer when one notes that a Japanese traditional bathing tub is shaped like a coffin. Current rakugo artists include Tachibanaya Enzō, Katsura Bunshi VI, Tachibanaya Takezō II, Tatekawa Shinosuke and Hayashiya Shōzō (9th). Furthermore, many people regarded as more mainstream comedians originally trained as rakugoka apprentices, even adopting stage names given them by their masters. Some examples include Akashiya Sanma, Shōfukutei Tsurube II, and Shōfukutei Shōhei. Another famous rakugo performer, Shijaku Katsura II, was known outside Japan for his performances of rakugo in English. Yamamura, Kōji, Mt. Head (a traditional rakugo tale adapted to film) . Nominated for the "Best Animated Short" Oscar in 2003.